Sun Ra (1914-93)--self-proclaimed visionary extraterrestrial of the "Angel Race," prophetic jazz band leader and composer, and lyrical proponent of Afro-futurism--was one of the most influential figures of twentieth-century music. Though many of his fans are familiar with the philosophical and spiritual dimensions of Sun Ra's work, most remain blissfully unaware of how artists have continued to explore time and (outer) space through the invention and composition of his legacy. The remarkable illustrations and essays of Traveling the Spaceways confront the visual manifestation of Sun Ra's philosophy and demonstrate how graphics and design were essential to his message of self-determination. 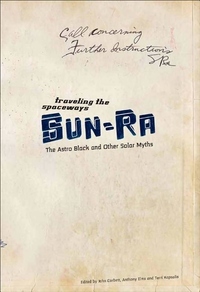 The influence of Sun Ra's openness to new technologies and experimentation, his sense of personal identity as a construct rather than a given, and his playful attitude towards history and mythmaking are all evidenced by the remarkable writers and artists who have contributed to this volume, including Pedro Bell, My Barbarian, Dave Muller, and Charlemagne Palestine. A refreshing reconsideration of the impact of Sun Ra's life on American history and visual culture, Traveling the Spaceways is an unforgettable look at the Ra persona in the context of contemporary art.